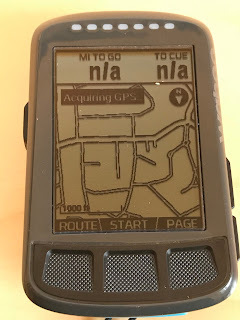 I have used Garmin devices for a number of years or should I say had. About a year ago I saw the light as it were and converted to Wahoo. Since doing this I haven't looked back. For me they were excellent at recording a ride and providing data to peruse over but that was about it. For me at least, I found navigating on them more or less impossible. 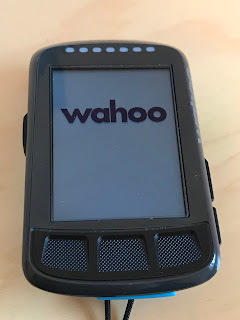 The 820, which I had for about a year, was actually the best of all of the Garmin devices I used but I remember trying to use it to navigate from Liverpool Street Station to Euston and it was a total joke. It was rubbish. It took ages to load and when it did it crashed and crashed again. Trying to be more independent in terms of navigation I started to used my iPhone and either google maps or RidewithGPS but it wasn't a long term solution. 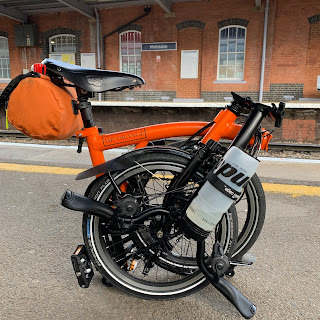 I was invited to go on an overnight ride to the south coast over a year ago by a group of people really into 'Specilaized AWOL' bikes that were kitted out in front racks, rear panniers, dynamo lights, UBS chargers...the list goes on. They were doing training runs to test out various items of equipment which they planned to use on various biking expeditions. They used the BOLT and its bigger screened sibling the ELEMNT simply as a way of navigating. I was amazed at how quick and simple it all was. Afterwards I took the plunge. This is about the BOLT which is slightly smaller than the ELEMNT but they both function identically. 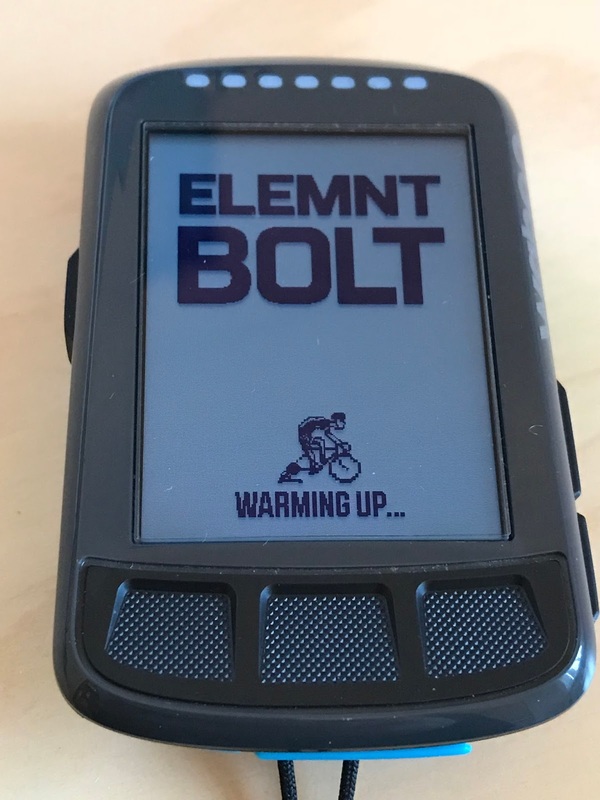 The BOLT is abbot the size of a Garmin 820. 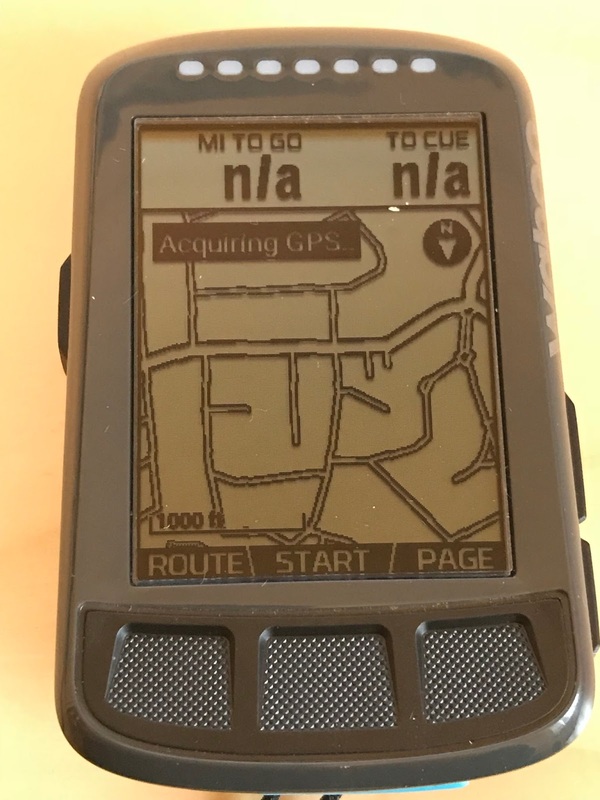 The big difference is that it has a greyscale screen - unlike the colour one the Garmin has. The other big difference is that it has no touchscreen. As you will read later, neither of these omissions is a problem. 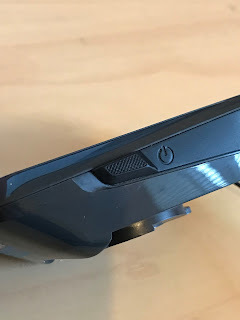 The BOLT has three buttons on the front of the device, one on the left had side to power on and two on the right side for scrolling up and down and changing the size view of the screen. It is quite a simple and just works. That near-phrase will be used again, possibly more than once. The BOLT is mounted on something similar to Garmin but specific to Wahoo. You get an out front mount and a smaller one that you can attach with cable ties (also included). I have the out-front mount on my road bike and the smaller one on my Brompton. You also get an additional mount which can be used on aero bars. Charding is via a micro-USB cable (supplied) and the good news is that it doesn't take and age to charge. Much is made of the BOLT's aerodynamic shape. I am sure it it but this is wasted on me I have to say. Still, marginal gains and all that. 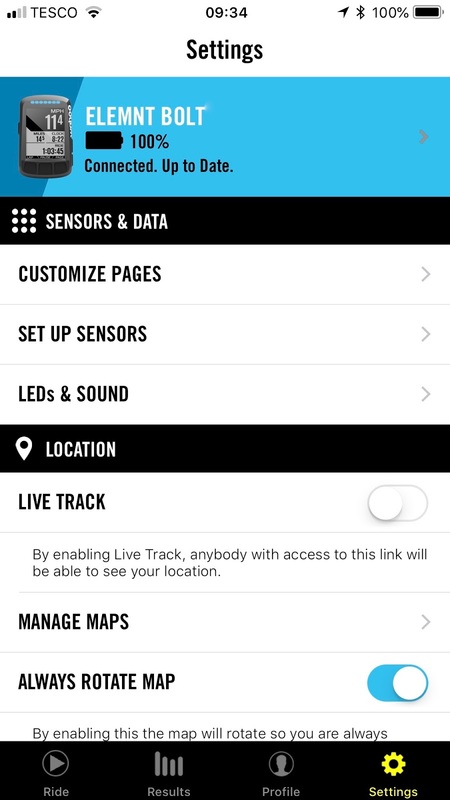 The BOLT works hand in hand with the companion app and it would be foolish not to do so. They work really, really well together! 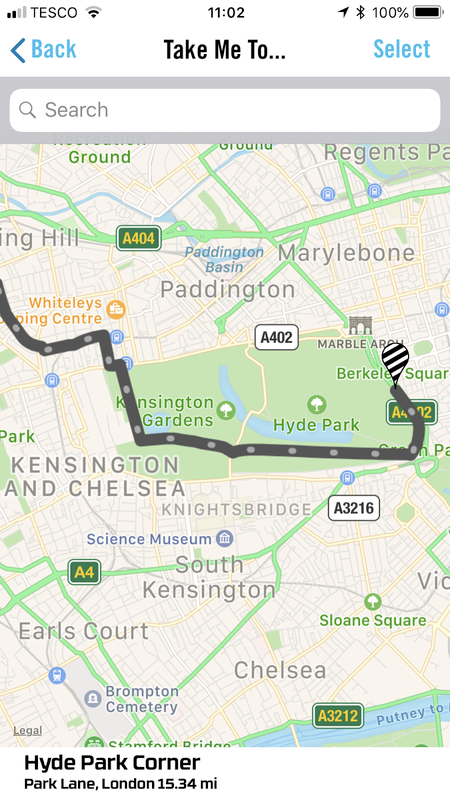 If for example you want to navigate somewhere, you can use the companion app to take you anywhere you like. Just type in to your phone and a route is shown as below. These are full turn by turn directions. You then send to your BOLT - and I kid you not within a 10th of a second - it is there on the BOLT ready to be used. No waiting around, no having to repeat yourself over and over again. It just works...and quickly! 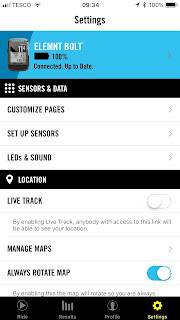 On the BOLT you can set up multiple custom pages and if you want data believe me the BOLT can tell you just about everything and certainly as much as I remember from the Garmin 820. 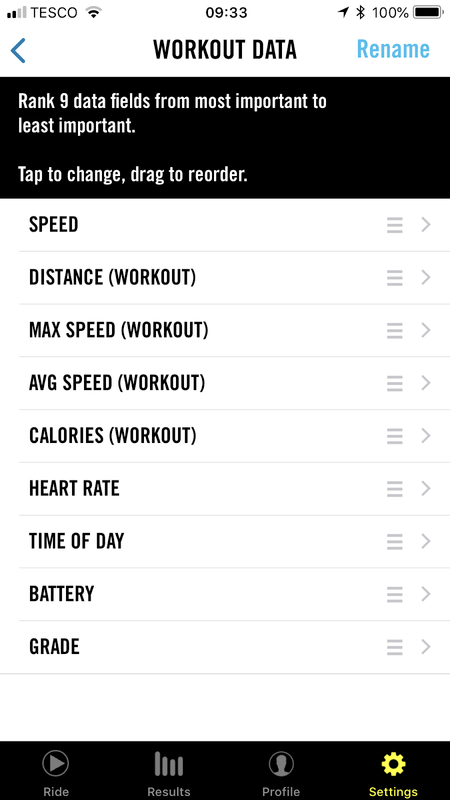 Setting this up via the app on your phone is easier and when on the phone, using the up/down buttons on the side you can make the number of fields showing on the bolt increase or decrease. 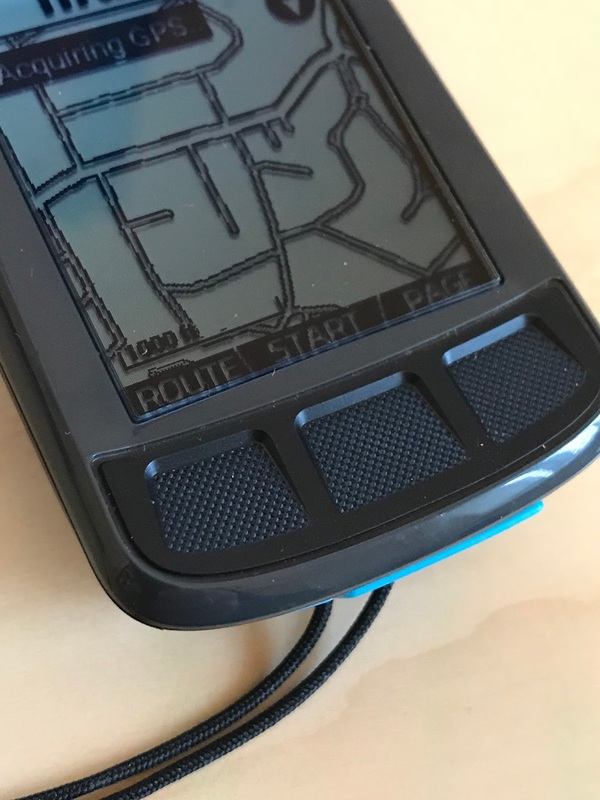 The map screen that you use to navigate has a black and white chevron line that you follow. You can zoom the map screen in or out to make bigger or smaller. You would think that it might be hard to follow not being in colour, but it is very easy to see, clearer and less prone to glare in the sun. I would go as far as saying that it works faultlessly. In addition to this I have found myself at various main line train stations and used it to get back to where I know. It is utterly, utterly brilliant for this. 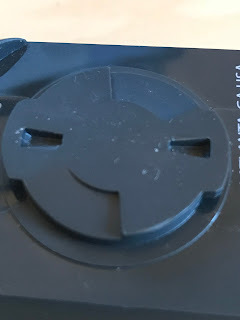 I feel much more confident using it. 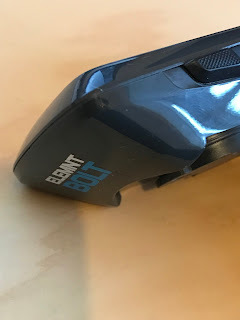 The one caveat - at least for the moment - is that if you go off course the BOLT cannot re-route you back to the route or calculate an alternative on the fly. 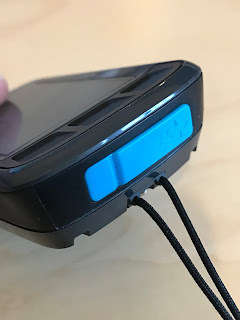 It isn't all bad however as loud bleeps and a set of red LEDs along the top of the BOLT let you know very quickly and it is quite easy to retrace your steps. To be honest I found the Garmin so terrible at dong this, I set it so it didn't re-reoute you anyway. 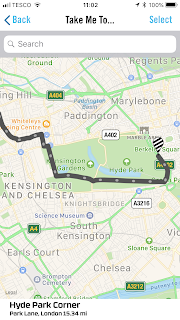 The other thing I have found is that the route seems to refresh very quickly. This means if you have lots of turns on a route, the BOLT can keep up. The greyscale screen is actually very good and clear to see and read all the data thereon and I the colour screen of the Garmin devices is not something I miss as a result. In addition, as the BOLT works in conduction with a iPhone the need the for a touchscreen is again not missed. Once a ride has been completed and you hit end the ride the BOLT does a few things almost instantaneously. 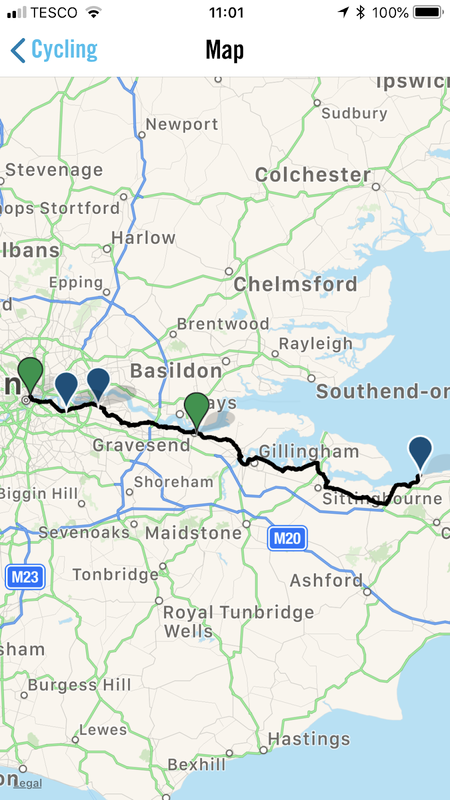 A map fo the route and ride data is ready and waiting on the ELENMT app on your phone. 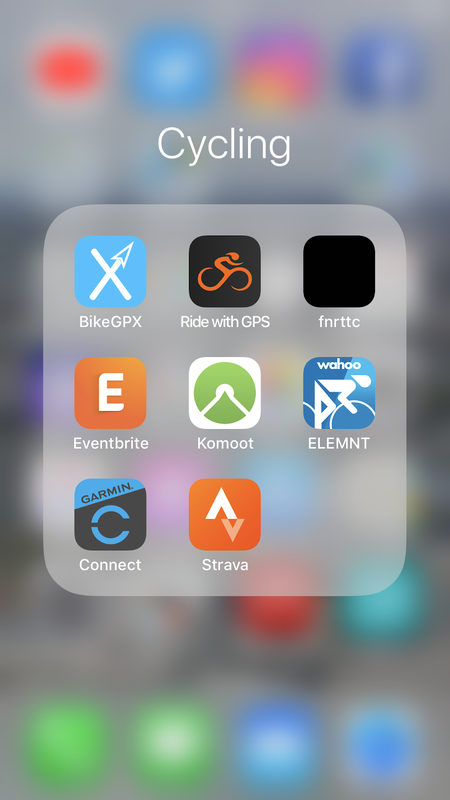 If you use STRAVA the ride data is already there as soon as you open the app to have a look. It's the same story if you use the excellent 'RideWithGPS' or any of the other apps that link with Wahoo. Again it just works and there is little fuss or drama in getting it to do whatever you want it to. 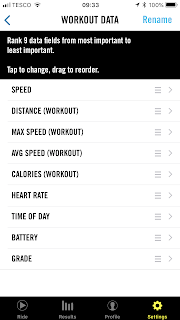 Another feature I have found useful for pre-planned rides is that you have a page for evaluation. This provides a side on profile of elevation as you are riding which allows you to check your progress on a particularly steep incline. This was put to good use when I recently did a nocturnal re-run of the CobbleMonster. 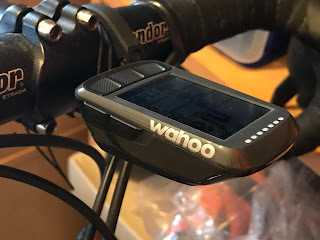 I am really glad a ditched the Garmin and went the Wahoo route and cannot sing its praises highly enough. 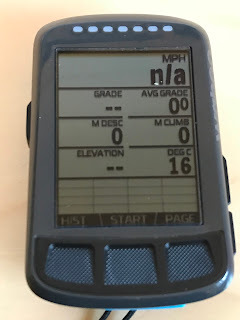 In fact the group of Specilized AWOL riders I cycled with last year told me that they deliberately tried various cunning ways of making the BOLT fail in terms of navigation and its ability to record all sorts of data with every sensor know to humanity but you've probably already guess...it just worked. Great review...thanks ...I'm off to buy a Bolt. Oh and I just bought a Brompton after years of prevaricating...onwards! I haven't had an M-type bar for some time. 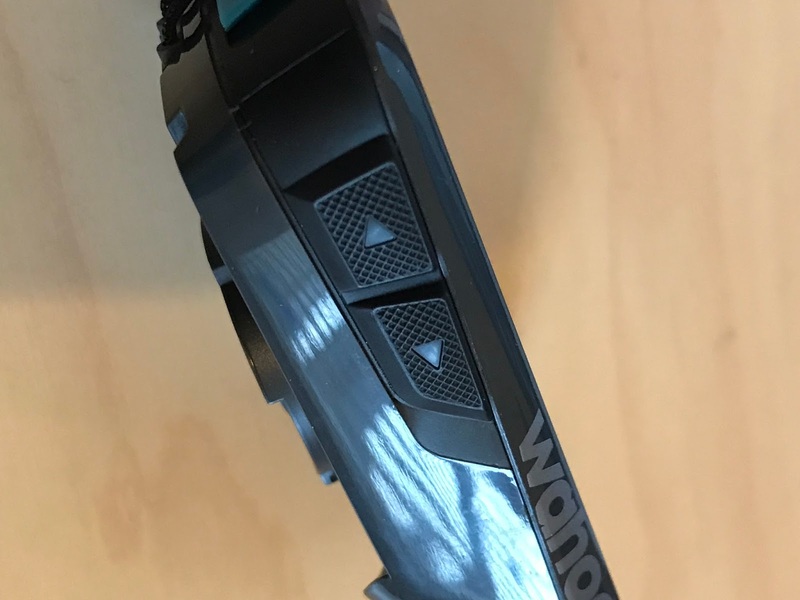 The up front mount would work facing towards you as you ride and the smaller disc mount would easily fir on somewhere.